September is finished, but my rug isn't. I really thought it would be done by the end of the month, and it is close I guess it's the border that slowed down the progress. 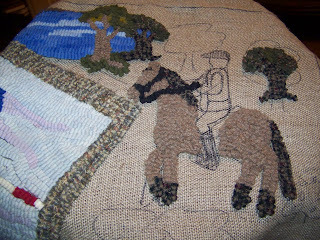 The border on the top now reaches the last motif, so I started the last horse hooking. I putzed around and fussed around and found wool in my barn studio, went to my old studio for more, and even acquired wool from the Salvation Army, all looking for a good, rich brown for the horse. I found the perfect brown in my sale wool at the old studio, put it in the washing machine, and then started hooking with the same heathery tweed I used for the trunk of one of the trees. I guess I just couldn't wait any longer. It's too bad dimensional hooking doesn't show up well in photos - this horse looks pretty blah in a flat photo, but I do like him when I can see his curves. I still haven't turned the rider into a cowboy, I still might make that change but probably won't since the horse's head is up too high for a western pleasure horse - he looks more like a European warmblood, which is completely inappropriate for the Grasshoppers since warmbloods hadn't even come to this country yet back when we were riding together.